WAKEFIELD, Mass. ‒ Sept. 25, 2012 ‒ The Fitness Industry Technology Council (FIT-C), a non-profit membership organization of leading organizations in the fitness industry, has issued a Request for Proposal (RFP) related to its Caloric Burn Data standards work. The group also announced its schedule of activities at the upcoming Club Industry show in Las Vegas. FIT-C’s mission is to grow the fitness industry by improving the fitness equipment user experience and maturing the collection of real-time wellness data through the creation of interoperability standards for technology-based fitness devices. Membership in FIT-C is open to all interested organizations. 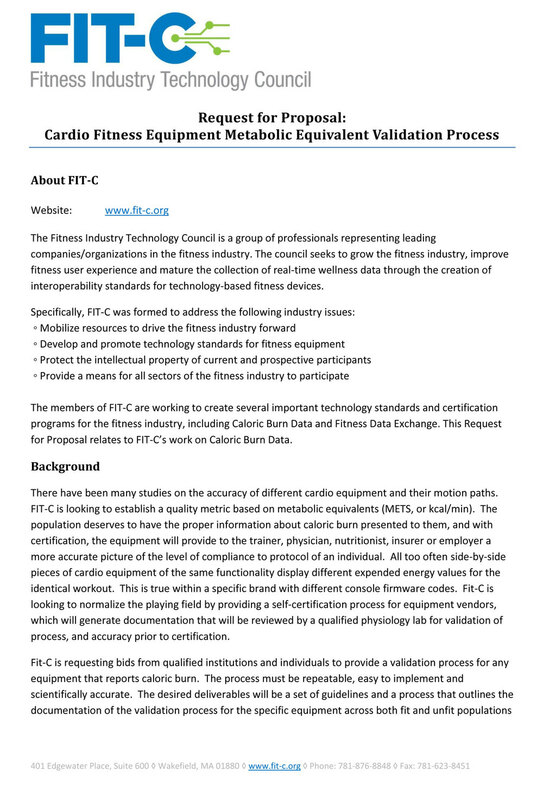 With its Caloric Burn Data RFP, FIT-C is seeking to establish a quality metric for fitness equipment based on metabolic equivalents (METS, or kcal/min) and is requesting bids from all qualified institutions and individuals to provide a validation process for any equipment that reports caloric burn. The qualification process proposed must be repeatable, easy to implement and scientifically accurate. The full RFP can be downloaded from the organization’s website. FIT-C invites the public to learn more about its RFP as well as its other technical projects underway, including efforts to share trusted fitness data across all layers of the fitness value chain, during an open Meet & Greet being held from 3 to 4 p.m. on October 11, in conjunction with the Club Industry 2012 conference in Las Vegas. Attendance is free of charge, but advance registration is required. FIT-C is also sponsoring a fitness technology roundtable for Club Industry attendees from 12:45 to 2:15 p.m. on Friday, October 12, entitled “Influence of Technology – A Glimpse at Tomorrow’s Health Club.” FIT-C President O’Rourke will lead a panel that includes Chuck Runyon, CEO of Anytime Fitness; Graham Melstrand, VP of Corporate Affairs for the American Council on Exercise (ACE); and Kevin Laferriere, CEO of Personal Training Academy (PTA) Global. Launched in 2012 by a group of industry-leading organizations, the Fitness Industry Technology Council (FIT-C) seeks to grow the fitness industry, improve user experience and improve the collection of real-time wellness data through the creation of interoperability standards for technology based fitness devices. Members of FIT-C include the American Council on Exercise, ClubCom, Core Performance, Dynastream Innovations, FitLinxx, FitPro, Green Fitness Equipment Company, Integerus, Intel, Koko Fitclub, Nexersys, Polar, Precor, Triumph Group Management, and True. More information is available at www.fit-c.org. You may access the FIT-C Caloric Burn RFP here.